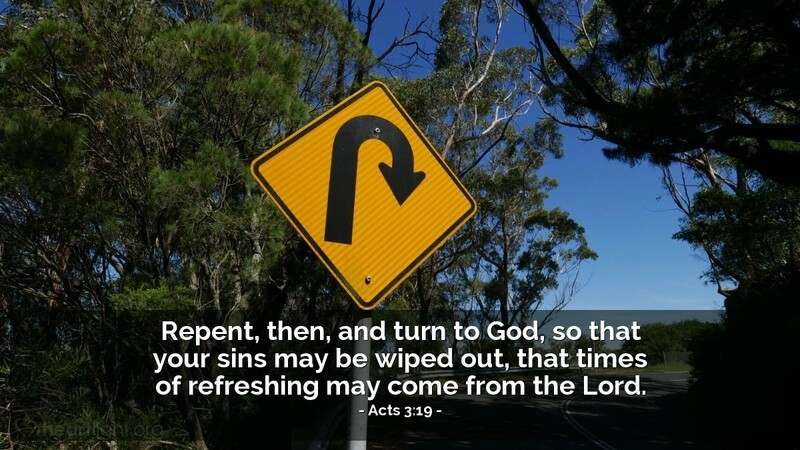 I'm not sure what we fear about repentance (turning our hearts and lives to God)? God will not only receive us; he will also redeem us and remake us. But that repentance is often so hard for us to do. We get stuck in old patterns of destructive and addictive behavior. We believe Satan's deceptive lies. We use self-deprecating thoughts to defeat the Spirit's work in ourselves. So why not come clean and confess our sins and truly turn our lives over to God? If we will, we will find something truly refreshing! Holy and righteous Father, I am not sure why I so doggedly hold on to some of my "pet" sins. Part of me wants to break free of these stumbling blocks, but part of me doesn't. I need your help in turning myself fully over to you. Please send your healing, cleansing, and refreshing power through the Holy Spirit to help me as I commit in my heart to fully and completely turn my life over to you. In Jesus' name I pray. Amen.